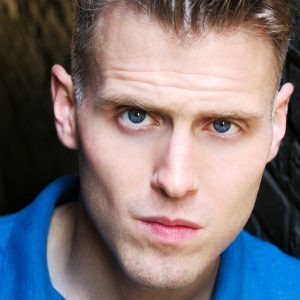 With the final week of performances for To Catch A Fish underway, we caught up with actor Jay Worthington (Ike Jeno) to learn a little more about him and what makes this show an important part of Chicago’s summer theatre scene. To Catch A Fish is based on the story of Chauncey Wright, a man suffering from brain damage who was tricked into illegal activity by federal agents. You can read more about the history behind the play in our Backstory article. Playwright Brett Neveu creates a fictionalized account of Wright’s story using the character of Terry—an African American man who, like Chauncey, suffers from brain damage and is unknowingly tricked into illegal gun sales by ATF agents. [Good theatre] comforts the disturbed and disturbs the comfortable. 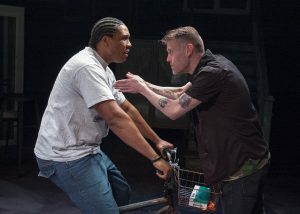 The themes of discrimination in Brett Neveu’s play hit close to home for Jay, though in a different way. Legally blind, Jay has a condition called ocular albinism, which reduces the pigmentation in the iris needed for proper vision. It also causes Jay’s eyes to move uncontrollably. “In grade school there were a few times I was ganged up on by a group of boys and beaten until I was unconscious. They did this because they didn’t like the way my eyes moved,” he said. As a result of his condition, Jay faces challenges in his every day life, from discrimination in casting to countless strange looks and the occasional “thoughtless or harsh comment regarding [his] eyes.” He both recognizes the differences between his own experiences with discrimination and those of a person of color and believes there is sympathy to be found in the commonalities they share. Ike (Worthington) applies pressure on the unsuspecting Terry (Geno Walker). The play is all about the families we choose, and the families that choose us. To Catch A Fish runs at TimeLine Theatre until July 1. For tickets, click here or call the Box Office at (773) 281.8463. Come join us for this critically acclaimed production!